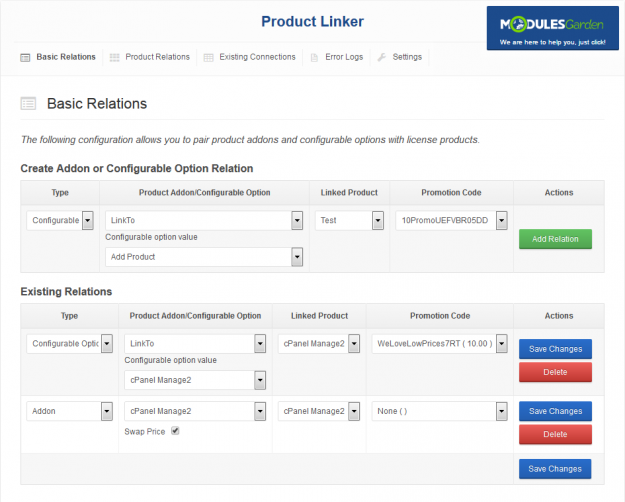 ModulesGarden Product Linker For WHMCS will allow you to create order relations between your products, addons and configurable options to sell them in bundles. Owing to our module your clients will be enabled to buy multiple products, addons and configurable options by ordering at least one of them! What is more, you will be able to bolster your offer with flexible and automatically adjusting promo codes. 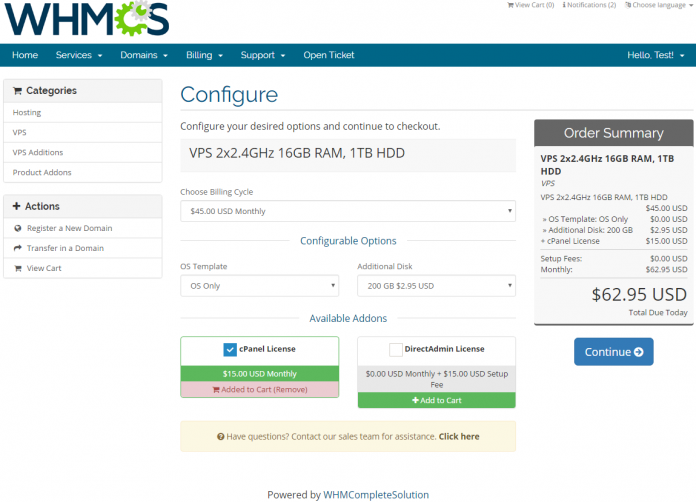 The module will let your customers buy for example a VPS account with ready cPanel license by ordering just one product specified by you. Furthermore, when module command is called on the main product (e.g. Create), the same action is called on all child products. This is a fantastic, time saving and convenient feature! Moreover, our module will allow you to view, filter, delete or even switch prices between existing connections used by your customers. What distinguishes our module further is that it can be combined with cPanel Manage2 For WHMCS, DirectAdmin Licenses For WHMCS and Plesk Key Administrator For WHMCS modules. Owing to that, you will be able to offer your clients ready virtual servers with active cPanel, DirectAdmin and Plesk licenses! You will be able to combine many different products together and sell them as a complete solution as well. Product Linker For WHMCS is an awesome tool to introduce cross-selling and up-selling into your business. Order our module today to enrich your offer, sell your products in attractive bundles and increase your earnings. very good module. once you start using it, you'll wonder how you did without it. We never thought we would need this module until we DID. Product Linker has allowed us to create special bundles and addons for our customers and simplifying the order process of many of our products. I am glad it existed when we needed it. ModulesGarden's expertise and support has always been outstanding for each and every module we purchased from them. Highly recommended! Bug Fix: Resolved issue with a fatal error occurring when filtering the existing connections by the "Main Product" and the "Linked Product"
Fraud prevention plugin to detect online fraud and therefore reduce chargeback. Automate domain imports, TLD pricing imports, plus 5 admin widgets to monitor your eNom account! Order Assistant helps you to automate order management process. It can automatically accept Pending Orders; send an email or open a ticket with client; and cancel the order if no payment is made still.